The Wapiti Cafe & Bakery is pleased to sponsor this page. Pop in or call us on 03 249 8899 to place your order! 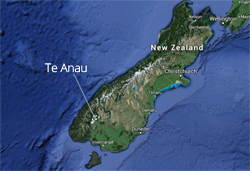 There are several places to buy fish and chips in Te Anau and Manapouri, and then stroll onto our lake front to gobble them up. The Wapiti Cafe & Bakery, next to Fiordland Frontier on the Lane, is famous for its fish and chips and burger menu, including blue cod. Get down there at 5pm on Thursday, Friday, Saturday and Sunday evenings from 5pm. 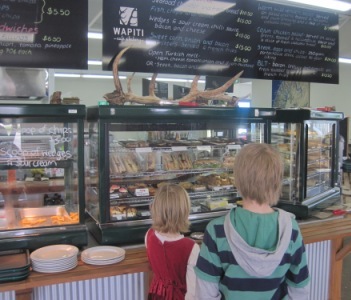 The Wapiti Cafe & Bakery is also a good place to eat your fish and chips inside if the weather is not so great, and is perhaps the only cafe in New Zealand where it feels normal for there to be deer antlers on top of the sandwich counter; this is Fiordland after all. Fish and chips can also be picked up from Mainly Seafood on the main street, which also has inside dining, and from the very friendly Dairy half way down the main street next to the Mobil petrol station. The Olive Tree Cafe is a great option for a high-class take away. It offers its entire menu as take away options between 5.30pm and 8.30pm, which includes everything from delicious mains to cakes. Take away pizza is a popular choice for take aways in Te Anau as we have so many Italian restaurants! 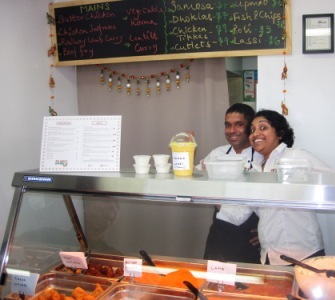 We also have SolGeo's; an Indian takeaway inside the Mobil Petrol Station (pictured left). It serves a range of indian dishes available in three different sizes depending on your appetite, including Vegetable Korma and Butter Chicken. There are also two Chinese restaurants in town offering take aways.